☆☆☆☆ “Created by Banshee’s Jonathan Tropper and based on the writings of Bruce Lee, Warrior follows the story of a martial arts prodigy, Ah Sahm (Andrew Koji), who comes to San Francisco in the 1800s with the intention of finding his sister (Dianne Doan) and bringing her back home to China … What unfolds is a story that is often entertaining but never quite as deep as it thinks it is.” –– TV Guide. ☆☆☆☆ “Imagine Deadwood with the town on the brink of a civil war. Now imagine that, into that floridly verbose fray, enters Caine from Kung Fu. Now imagine that, as the heavens intended, Caine was being played by Bruce Lee. That’s something resembling the conceit of Warrior … Rarely lives up to the lofty heights of that conceit, but since the full realisation would be the greatest show in the history of television, it’s an unfair standard to hold anything to.” — The Hollywood Reporter. 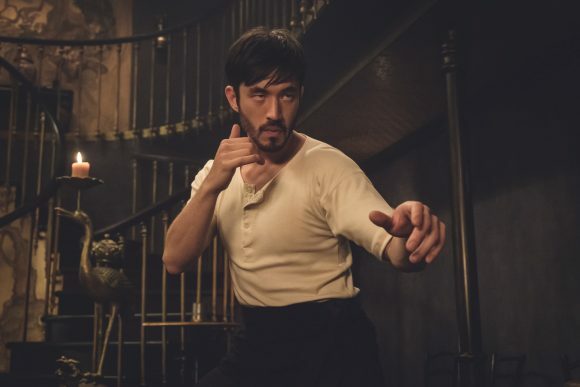 ☆☆☆☆ “A new Cinemax series marries a concept dreamed up by the martial-arts master with all the bells and whistles of modern TV — to stirring effect … A lush action drama, set in San Francisco’s Chinatown in 1878, Warrior feels like someone asked, ‘What if The Knick, but with hatchet fights?’ … Warrior is a blast.” — Rolling Stone. ☆☆☆☆ “There is a lot of fighting, of many varieties — kung fu and hatchets in the street for the Chinese characters, bare-knuckle brawling for the whites (mostly Irishmen), and some Wild West gunplay in a stand-alone episode at a stage stop that pays tribute to both John Ford and Tsui Hark … But Warrior has competing agendas that keep distracting you from the action.” — New York Times. ☆☆☆☆ “Warrior has its charms and much like a Chinese Peaky Blinders or Gangs of New York, it’s best when it leans into mankind’s reaction to corruption and injustice. In an increasingly angry world that continues to demonise people out of fear, Warrior provides a reflection and catharsis, all wrapped in a badass bow.” — IndieWire. Warrior is what Kung Fu could have been.